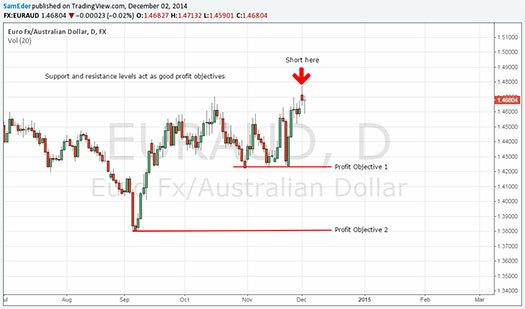 After you get into your trade, very rarely does your position go in a straight line to your profit objective. Instead, different things happen. So, if you only have one tool in your toolbox, you will struggle to react effectively to all of the different outcomes that can happen in an open position. If you only have a hammer, you’ll treat everything like a nail – even when your trade screams for a screwdriver or a measuring tape. Instead, plan on packing your trading toolbox full of different tools for different scenarios. That way, when the moment calls for it, you can make the right decisions appropriately about when to stay in a trade or when to exit and how best to exit. I learned about the benefits of using an exit strategy with multiple rules at the systems development workshop I attended with Van and RJ in Sydney, Australia. Here is my take on the subject along with some charts to demonstrate possible scenarios. Your trading plan should note specifically when and how each exit should be applied for each trading system. I am talking about exits in the context of a “rule-based discretionary” trading approach. These exits allow you flexibility over the strict execution of mechanical system rules but they are not to be applied on whim. Furthermore, each exit rule for your trading system should be in harmony with the objectives of your trading system. Each exit type rule exists to achieve a specific goal for a trade and not every type of exit is applicable to every trading system. In practice, using multiple exits has proved very valuable for my trading and it is probably one of the easiest ways to improve trading system performance. I just wish I had spent more time on this area earlier in my trading career instead of beating myself over the head looking in vain for the Holy Grail entry. Yes, sometimes your job as a trader is to do nothing at the moment but even at those times, you should have planned out what you will do with the trade in various scenarios that will arise. Van stresses the importance of simplicity (vs. complexity) in trading. Evolving trades, however, produce far too many different circumstances to let you be effective with just one reason (simplicity) to exit a position. Instead, it’s better for you to understand the multiple possibilities and reasons why you would get out of a trade and then create a set of clear rules for those reasons. Your intent with your exit strategy is to manage risk and protect your profits depending on what the market does even though this implies complexity. Luckily, Van allows for two exceptions to his simplicity standard – one of which is exits. (The other exception is position sizing strategies.) Each individual exit rule on its own should be quite simple yet combining together many simple exit rules may form a complex exit strategy which helps your trading system more effectively meet its objectives. Think: When the price action changes, you need to be ready to change your reason (and rules) for exiting a position. Throughout your trade, the market is going to throw you all sorts of different scenarios. It is constantly going to force you to make decisions about what to do. Often, it will be best to sit tight and do nothing, but there will be times when action should be taken. It is at each of these “decision points” that your complex exit strategy comes into play. You will need to assess the current market, your position, and apply the right tool for the job to manage your trade properly. A decision point could arise for multiple reasons — an “important” price may get hit, a reversal pattern forms, the price reverses some number of R-multiples, and many more. For each situation, you need to decide if you are going to stay in the trade or if it’s time to exit completely or simply reduce the size of your position. Be aware of all of the decision points you are going to face and have rules written about how to act when they do. Consistently following well defined processes will help you create a consistent set of results and allow you find ways to improve. Trading effectively what’s in-front of you is all about being prepared. Let’s look at various exit types and possible rules you might want to have at your disposal when you reach possible decision points. Striking some balance between letting profits run and locking in gains very much depends on your objectives, your trading style and your personality. Always remember a primary guideline — let your profits run as much as possible. A useful profit objective can be a resistance level such as an old high because the chance of the price reversing increases once it hits this level as broad profit taking often occurs there. You could also use a Fibonacci level or pivot point. 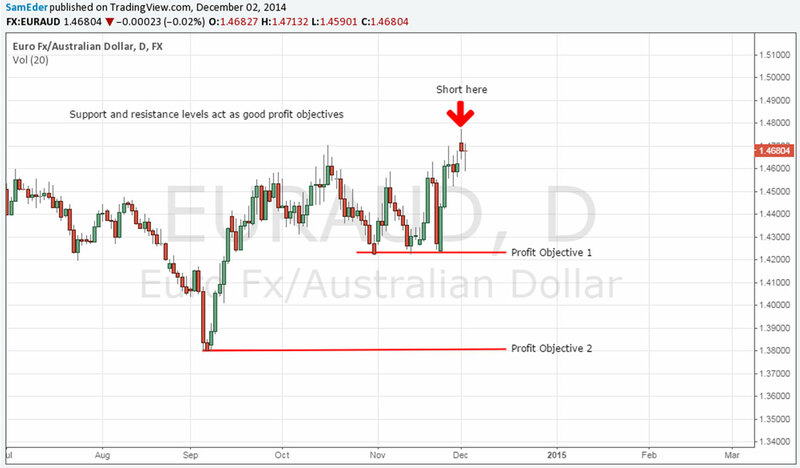 Most important – have some logical profit target and some rules about what to do if price gets there. To view a larger version click here. One of the cardinal sins that amateur traders engage in is letting winning trades turn into losing trades. To stop this scenario from happening, you can apply a maximum intra-trade drawdown rule, or a maximum amount you are willing to give back in order to achieve further gains. Generally you would select a maximum R-multiple you are willing to give back. For example, if you have a +5R profit, you may institute a trailing stop of two or three times your original risk amount so that you lock in some of your profits while allowing the position to continue in the profitable direction. Note – if you are going for a large profit objective, you may need to be prepared to give back more multiples of your risk than if you are going for a more conservative profit objective. We will continue next week in Part 2 of this article examining the remaining six exit types you can consider adding to your trading system.